A Bummer Summer? No Way! WINNIPEG – Not only were barbecues sizzling in August. August MLS® sales were at record levels for this month and dollar volume shattered its previous best for August by going over $300 million for the first time. The same occurrence happened in July with dollar volume easily eclipsing $300 million too. MLS® sales were also at near record levels. And like the fish that got away, if WinnipegREALTORS® had reeled in 8 more MLS® sales in August it would have reached a new milestone level of 1,300 for this month. This also happened in 2011 and 2005 where they were 10 and 7 short respectively of reaching 1,300 MLS® sales. Whether walking, biking, gardening, golfing, at the cottage or golfing at a course near your cottage, the 1600 strong REALTOR® network reached out across the entire WinnipegREALTORS® market region to deliver the best combined summer months of market activity in the association’s 110-year history. Helping bring up dollar volume to the record level for August were three million dollar plus sales including a condominium that sold for just under $1,300,000 on Waterfront Drive. An increase in MLS® listings continues to be one of the main highlights this year with new listings up 15% in August to 2,002. Active MLS® listings or the current inventory at the end of August is now over 4,000 and that represents a 20% increase over the same time last year. August MLS® unit sales increased 4% (1,292/1,241) while dollar volume rose 9% ($326.9 million/$298.7 million) in comparison to the same month last year. Year-to-date MLS® unit sales are down 3% (9,111/9,387) while dollar volume is up less than 3% ($2.36 billion/$2.30 billion) in comparison to the same period in 2012. Evidence of more balanced market activity came in August when there were twice as many homes that sold below list price as went for above list price. 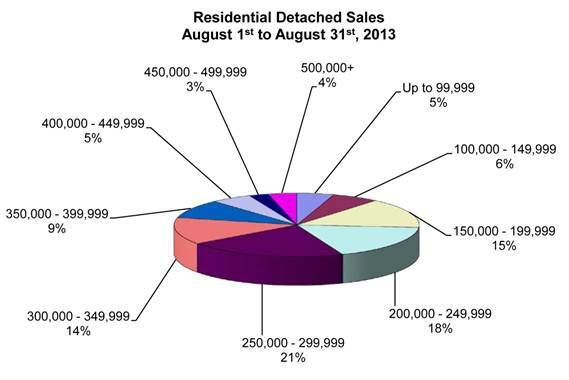 The most active residential-detached price range in August was from $250,000 to $299,999 at 21% of total sales. Close behind was the $200,000 to $249,999 price range at 18%. The highest priced home sold in August went for $1,640,000 while the lowest only sold for $20,900. The average days on market for residential-detached sales was 28 days, 4 days quicker than last month and 1 day ahead of the pace set in August 2012. No contest again with the most active condominium price range being from $150,000 to $199,999 at 36% of total sales. What is interesting though is the fact the second most active price range at 20% of sales was not the next higher one but the $250,000 to $299,999 range. The average days on market for condominium sales was 35 days, 2 days slower than last month and 1 more day than August 2012. Established in 1903, WinnipegREALTORS® is a professional association representing over 1,800 real estate brokers, salespeople, appraisers, and financial members active in the Greater Winnipeg Area real estate market. Its REALTOR® members adhere to a strict code of ethics and share a state-of-the-art Multiple Listing Service® (MLS®) designed exclusively for REALTORS®. WinnipegREALTORS® serves its members by promoting the benefits of an organized real estate profession. REALTOR®, MLS® and Multiple Listing Service® are trademarks owned and controlled by The Canadian Real Estate Association and are used under licence.